Looking for a dish to make using ingredients you already have in your kitchen? Look no farther than this vegetarian tortellini bake! This casserole-style dish is completely vegetarian, but is filled with so much flavor that your carnivore friends won't even notice. 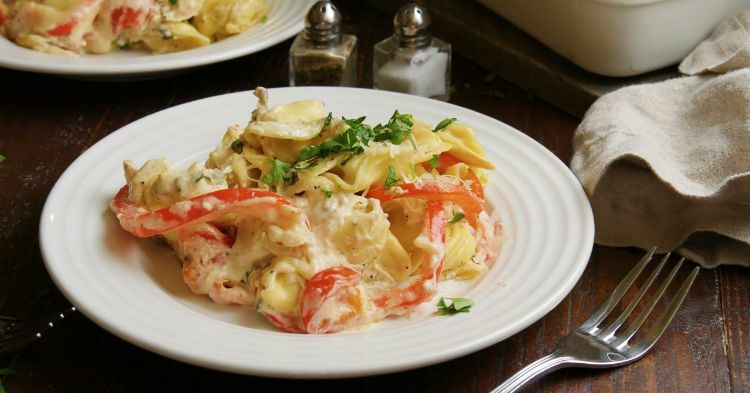 The dish is loaded with fresh garden veggies and delicious cheese tortellini pasta, all combined in a velvety mushroom/cheese sauce. Although the list of ingredients may look daunting, fear not. The recipe below simply involves preparing each element of the recipe, and then combining them in a baking dish to become golden and bubbly. Covering the top with a snowfall of freshly grated Parmesan cheese brings the whole dish together, and will have the whole family begging for more. Preheat oven to 375 degrees Farenheit. Spray a 9-by-13-inch baking pan with non-stick spray, and set aside. Cook tortellini pasta according to instructions on the package for "al dente." Add the carrots and zucchini to the boiling water during the last minute of cooking the pasta. Drain the pasta, carrot, and zucchini, and set aside. In a large pan, melt the butter over medium-high heat. Add the garlic and mushrooms to the pan. Sauté until the garlic turns slightly brown and the mushrooms become tender. Add the flour to the pan, and season with salt and pepper to taste. Stir to combine until the mixture starts to thicken, about one minute. Slowly add the vegetable stock bit by bit to the pan while continuously stirring. Combine until the mixture has reached a sauce-like consistency. Break up the cream cheese into small cubes. Gradually add them to the pan, stirring constantly, until the cream cheese has fully melted and the sauce has a rich, velvety consistency. Add the tomatoes, basil and bell pepper to the pan. Stir to combine and allow to cook until the peppers soften and the tomatoes start to break down, about 3 to 5 minutes. 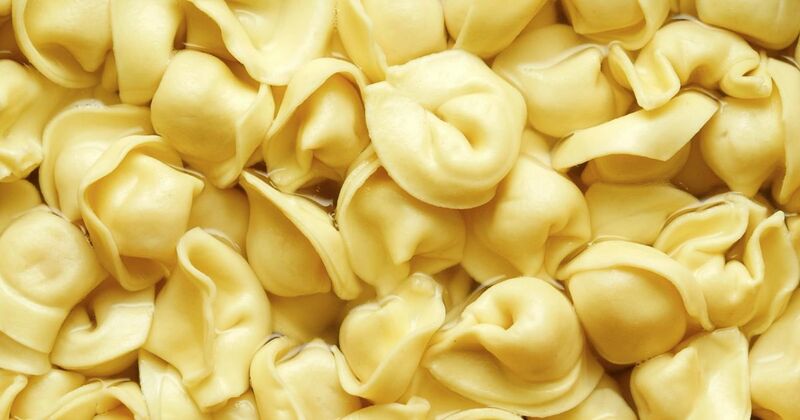 Retrieve your greased baking dish, and add the tortellini to the bottom, spreading them out in an even layer. From there, carefully cover the pasta with the mushroom/veggie/cheese sauce mixture, so the pasta is totally coated. Sprinkle the Italian cheese blend over the top, followed by the grated Parmesan cheese, so the surface is fully covered. Cover the dish with aluminum foil and place in the oven to bake until the dish is cooked through and the vegetables are soft, about 30 minutes. When cooked through, remove the foil from the dish, and allow to bake 10 minutes more, until the cheese on top is golden brown and the edges of the dish are bubbling. Remove from the oven. Allow to sit 5 minutes so the dish can stabilize itself. Garnish with a little extra Parmesan cheese and/or fresh basil, and serve individually. Pro-tip: This dish can be adjusted for your non-vegetarian friends by using chicken stock and adding roasted chicken cubes. Pro-tip: Remember to cover the dish with aluminum foil before baking otherwise the cheese on top may burn!